Why yes, there is a JawsFest. Thanks for asking. 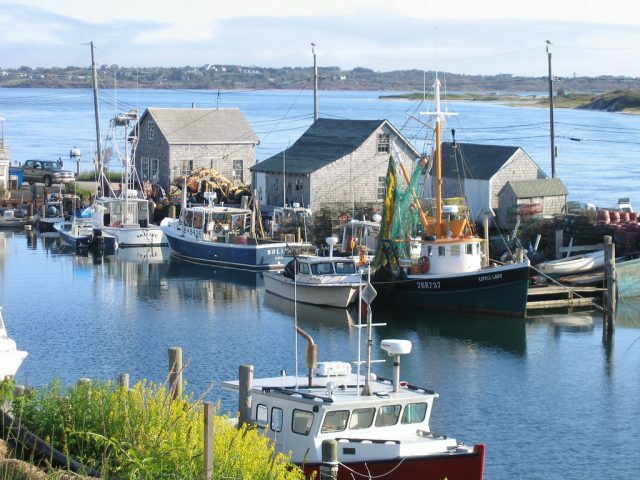 Late summer and early fall are the best times to plan a tour of coastal New England. Slightly cooler temperatures mean the summer beach crowds have thinned considerably, so you’ll be able to fully enjoy the experience. And, more importantly, find dock space. Hence, this New England Cruising Guide. I’ve been struggling to put a timeline on this New England cruising guide. Ideally, you’ll have two full days at each location to fully immerse yourself in the culture and quirks. Plus, there were five or six other other locations I wanted to add but ran out of space. Damn you, word count! So, use this as a loose guide to planning out your perfect New England cruise. Whatever you choose, you can’t go wrong. 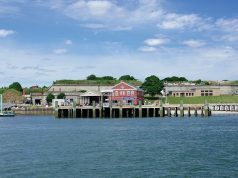 A must-see when cruising New England? Boston. The what: One of the most historic cities in America. To do: Walk the 2.5 mile Freedom Trail and immerse yourself in the history of the American Revolution. Or head over to the Boston Public Market (100 Hanover Street) and peruse all manner of unique New England specialty items. If you are a baseball fan, catch a Sox game at Fenway (4 Yawkey Way). 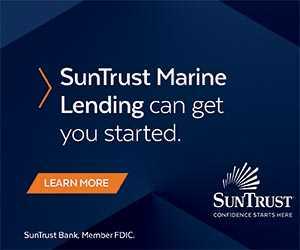 If the kids are with you, check out the New England Aquarium (1 Central Wharf). To eat: A greasy classic is a must, so grab the fish and chips at the Barking Crab. Oh, and you can’t leave the city without trying its namesake Boston Cream Pie. We like the twist they add at Legal Sea Foods. To dock: Boston Waterboat Marina. 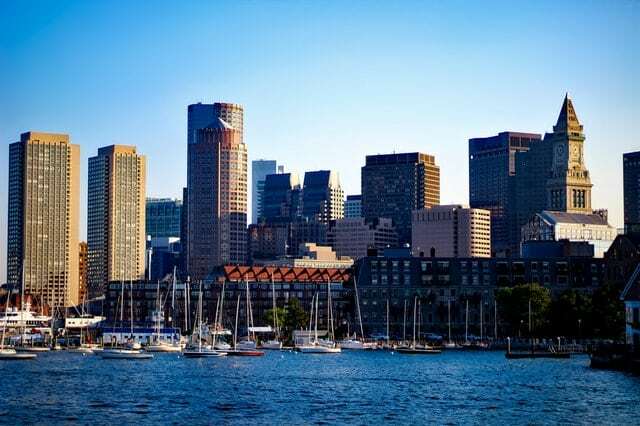 Located on historic Long Wharf in Boston Harbor, Boston Waterboat Marina is just steps from the attractions above. If you needed any more history, Boston Waterfront Marina is the city’s oldest continually operating yachting facility. The what: Picturesque rocky shores, some of the state’s best beaches. Oh, and lobster. Did we mention lobster? To do: Take a ride out to Goose Rocks Beach or walk along the cliffs of Marginal Way, a paved path that wraps around rocky shores. To eat: Do I need to say anything here? Lobster. Have some lobster at the famed Clam Shack (2 Western Ave). Then have some more lobster at Chowder House (79 Pier Road). To dock: Chicks Marina on the Kennebunk River. Their concierge service is top-notch. 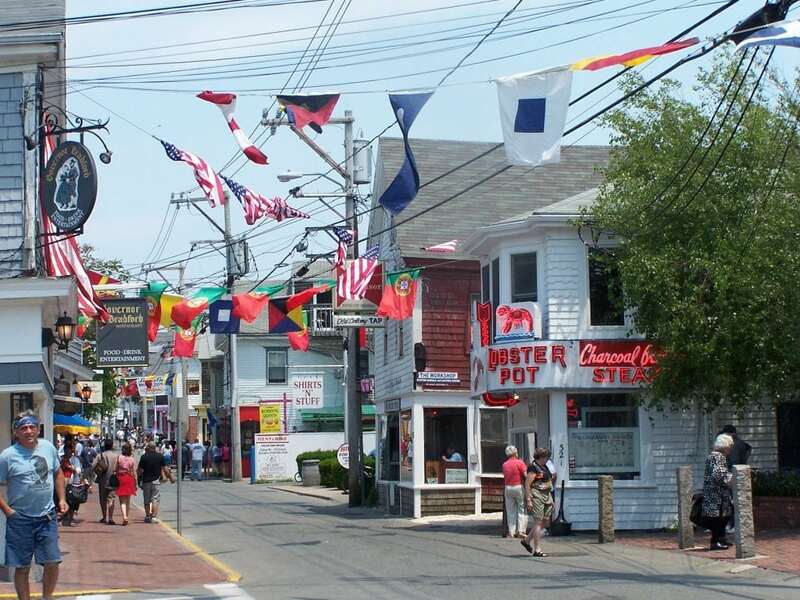 You can let your freak flag fly in the welcoming artistic Cape Cod hamlet of Provincetown. The what: Quintessential Cape Cod. The pilgrims landed here, as did some more eccentric types. Beaches and artists make P-Town a must-see. To do: See where the Pilgrims first landed at the Pilgrim Monument. Stroll Commercial Ave for the best people watching around. To eat: Start your day with pastries at Connie’s Bakery. End it with frosé and clams at The Canteen. To dock: The aptly named Provincetown Marina. Anchorages are lovely here as well. It doesn’t get more New England than Nantucket. The what: The classic summer destination. This idyllic whaling town turned quaint little summer getaway is a favorite to many. To do: Marvel at the gorgeous architecture, rent a bike and test yourself on the cobblestone streets. The entire island is designated as a National Historic Landmark, so the Historical Society has some suggestions for you. To eat: Grab a sandwich at Something Natural before you head out exploring. For fine dining, we like the modern twist that The Proprietors take. 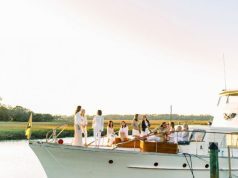 To dock: Moorings are first come, first served at Nantucket Moorings. Our advice? Come first. The what: If you want to see Martha’s Vineyard in her full glory, you need to see Chilmark. To do: Pretend you’re on the set of Jaws. Parts of the Spielberg classic were filmed on the Vineyard. A good portion of it was set in Chilmark. Or, take in the sights at Gay Head Light. To eat: It’s BYOB at the Chilmark Tavern (1435, 9 State Rd) if you’re into that sort of thing (I am). Or for the butteriest lobster bisque you’ll ever have, try the Menemsha Fish Market (54 Basin Rd). 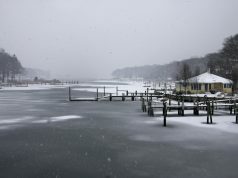 To dock: The harbor is tight, but there are moorings available at the east and west sides of the harbor entrance. 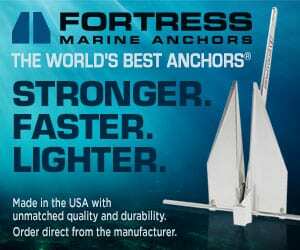 Contact the harbormaster for more information. One of the many historic mansions in Newport, RI. 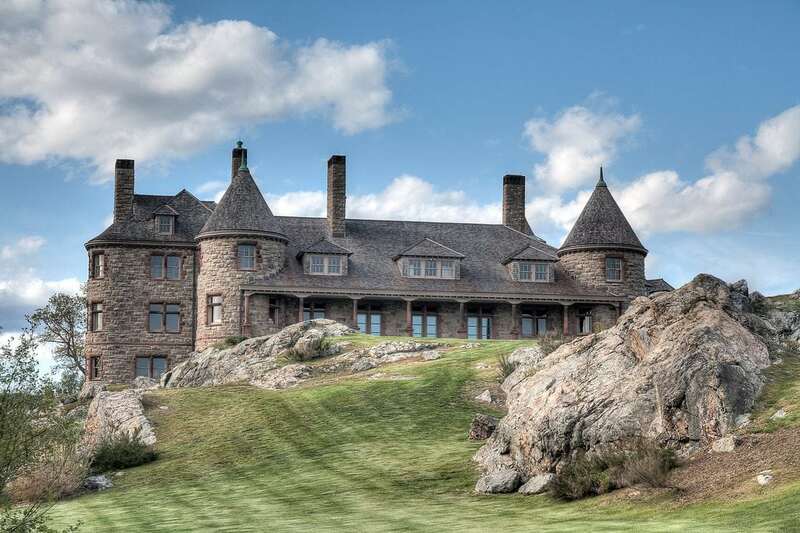 The what: America’s first resort town is full of mansions, music festivals, and boating. To do: If you’re there on time, you can visit the Newport Boat Show in September. If not, shop on Thames Street. Walk off the inevitable seafood feast you’ll consume on the picturesque Cliff Walk. The mansions along the way can barely compare with the ocean views. To eat: If you’ve had enough lobster, take a breather with some Mexican-inspired cuisine at Diego’s or Perro Salado. To dock: You’ll be in the center of all the action at Bowen’s Wharf. Full? Try the Newport Yachting Center. 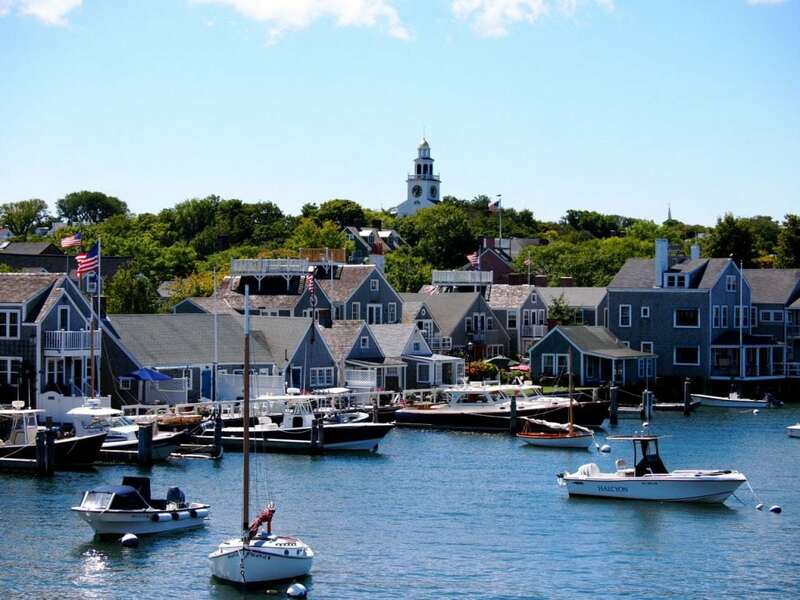 Other amazing locales to squeeze in if possible include Bar Harbor, ME or Block Island, RI and Montauk, NY. I have fond memories of Shelter Island as well. All are accessible depending on how you plan your trip. Bar Harbor could be after Kennebunkport, Montauk is a quick jaunt from Block Island. 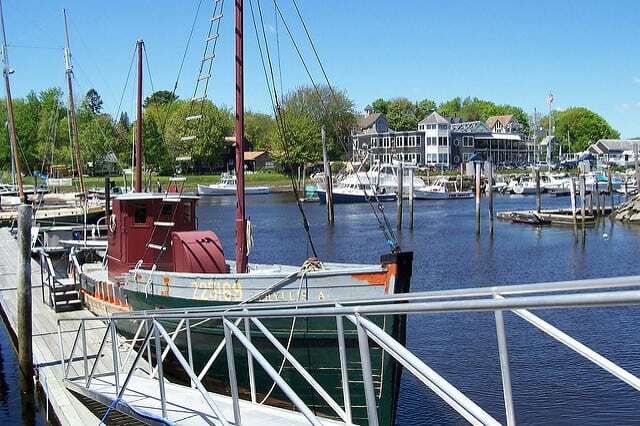 Where are your favorite places to cruise in New England? What should we have included on the list? Let us know in the comments below! This New England review is one of the best ever! Having lived there for years I can never wait to get back to visit and your list is top notch! The writing is fun and inspiring and I give you a big Thumbs UP! for an entertaining and informative read!